For years, Sensei told us to “steal” the techniques when in Japan. Because if you took a movement or a waza, no one would lose anything. So I was surprised last Sunday that he said the exact opposite! But both options are correct because this question is only a timeline problem. So how can we reconcile this apparent paradox? Here is my proposed explanation. Sensei keeps saying that he is teaching the Jūgodan exclusively, and he forces us to free ourselves from the Waza. If you are a Jūgodan and continue to “steal” techniques, then you have no time to develop your taijutsu, free from the Waza. You are a thief. But there is a time when you are a young padawan (2), and things do not make sense at all. It is even worse if you have the chance to train in Japan. The Bujinkan is a Sanshin with three levels: Shidōshi, Jūdan, Jūgodan, and at each level we must adjust the way we learn. At Shidōshi, you “visit” the schools, the weapons, and you develop your understanding of the whole system. Supposedly you have a good knowledge of everything; you are only missing the Kūden, the experience. In my opinion, this is the period where you have to “steal” what you are missing. As I wrote earlier, it deprives no one of anything but it helps you fill in the technical gaps you might have. When you reach the Jūdan level, the “stealing” period is over. It is now time to dig deeper in your abilities through the five elements. As you know, each rank above Jūdan is linked to each one of the five elements. When finally you reach the Jūgodan level, you begin to express your feeling about Budō. And this is what you pass on to your students to the extent that it is easy to name the teacher of any shidōshi you see on the mats. We all have a particular “touch”, and our students behave exactly like us. Last year, Sensei asked the Japanese Dai Shihan to teach only from the Denshō. Sensei teaching only the Jūgodan, the Dai Shihan have the responsibility to prepare the next generation, and this is why they were asked to teach only from the denshō. 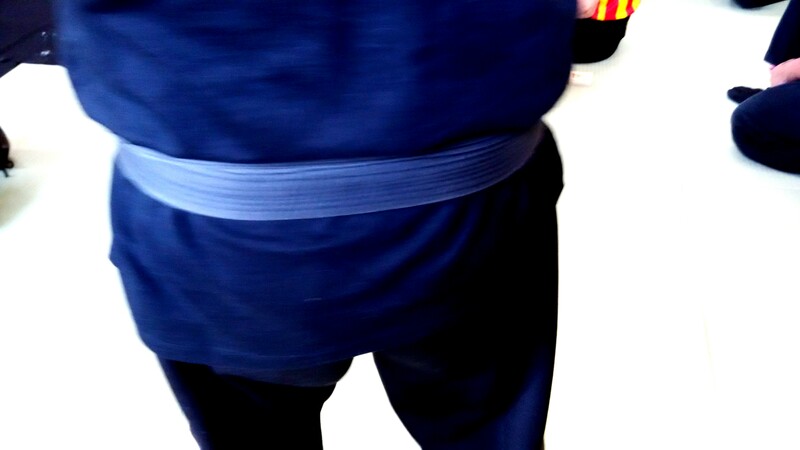 But with them too you will learn a personal approach of Budō. In fact, each one of them has a unique Budō flavor. What you get from training with all of them is a chance to develop your mix. And this is the final objective because Sensei wants the Jūgodan to develop their interpretation of Budō. This last level comes after learning the basics, the ryūha, the weapons. And after you developed a good understanding of Budō. You have to create your “Budō flavor” and to do that, you cannot steal. You have to be spontaneous and creative. Stealing at this level would be like copying Da Vinci’s Mona Lisa. Even if you would make it close to perfection, it will never be the original Mona Lisa. Because we have to be free from the forms, we must learn them precisely, without this learning stage, it is impossible to get a natural flow. Natural flow doesn’t come out of anywhere. And until then, we have to “steal” what we don’t have. So you now get why this apparent paradox is not one. A beginner will never be able to understand the depth of Sensei’s Budō, what you see in class is never what it seems. The best is to copy (steal) what your teachers do in the dōjō until you have it. See that as some scaffolding. It supports your progression until a certain point. But if you stay at this level there is no way for you to reach the freedom of movement that Sensei is teaching in every class. Once again. When your technical skills get good, you have to stop stealing the technique, on the contrary, you now have your personal way of moving developed by years of polishing your techniques. When you train, you must understand the gokui, the essence of what you see. Trust me, this is a very long process as we never know if our vision is coherent with real fighting. Budō is coming from actual combat; not from a sport. Our techniques are old and come from a natural selection where only the best (and the lucky ones) could survive on the battlefield. At the strategy level, there is no more time for stealing, you have what you have. At Jūgodan level, you are responsible for your actions, and your only objective is to survive with what you have acquired. If you are a true Shihan, stop behaving like a thief. Maybe some people won’t understand but that make this writing even more better. Thanks for this experience and the Topic. It make sense. I have heard that before but it was not given any thought in my zero brain. But I remember that Question…. we know our level from Senseis talk. Always behind of the understanding. .. yes indeed the process is long like a lifetime. i like what you write.i hope a lot of people will read and understand what you think. You probably will ask yourself who am I? So you can ask my old friend Moti nativ. We trained together with Doron navon for many years.. It makes me think that stealing is good to build internal references. And that becoming oneself a living expression of a teaching is a different process.